Columbia, Mo. (Feb. 6, 2019) — Brian McGill, a Kansas City native and multimedia editor for Politics and Policy at The Wall Street Journal, will serve as the 2019 J-Day keynote speaker. The annual statewide event will be held Monday, March 25, on the University of Missouri‘s Columbia campus. 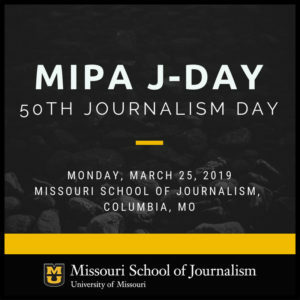 J-Day, an annual Missouri Interscholastic Press Association statewide event hosting more than 1,500 high school students, will be held Monday, March 25, on the University of Missouri’s Columbia campus. More than 1,500 students from high schools that are members of the Missouri Interscholastic Press Association are anticipated to participate in a variety of workshops and speaking presentations related to journalism skills and careers, compete in Write-Off competitions and celebrate the production of outstanding work at an awards ceremony. MIPA’s Student Journalist of the Year award will be presented to Abby White, a senior at Lee’s Summit West High School. White serves as editor-in-chief of the Titan Scroll student news magazine, advised by instructor Carol Ullery. White plans to attend Mizzou in the fall and will receive a $2,500 scholarship from the Missouri School of Journalism. McGill, now based in Washington, D.C., previously worked at Atlantic Media, The Tampa (Florida) Tribune and the Springfield (Missouri) News-Leader. He conveys his reporting and analysis of news through data visualizations for both print and online platforms. McGill’s work includes everything from information graphics, 3D modeling, interactives, news games, cartography and illustrations. Projects he has reported on include four presidential elections, NASA, gender inequality, sporting events, economic development and historical events. McGill graduated from Mizzou in 2002 with a bachelor’s degree in journalism with an emphasis in photojournalism and information graphics. As a high school student at Oak Park High School in Kansas City North, he was a member of the “Cambia” yearbook staff and also attended J-Day. Examples of McGill’s work are available online at brianjmcgill.com. Support for McGill’s visit is provided by the William Randolph Hearst Endowment for Visiting Professionals, established in 1990 at the Missouri School of Journalism by the William Randolph Hearst Foundation. MIPA was founded in 1923 at the Missouri School of Journalism. It is a state organization for journalism advisers working in association with the Missouri School of Journalism, the Journalism Educators Association and the National Scholastic Press Association. Membership in MIPA provides support via its website and listserv, full access to contests with valuable feedback, content to help journalism classroom instructors and a network of journalism teachers in Missouri to assist teachers and advisers at any time, plus new programs to address timely topics. Membership is by school, with the fee based on the number of publications and programs. To learn more or to join MIPA, visit www.mipajournalism.com.